Job seekers can send in their Verizon application for a chance to work for one of the most successful companies in the telecommunications sector. Founded in 1983, Verizon is currently the largest wireless communications service provider in the United States, as well as one of the leading companies in broadband telecommunications services. Verizon Wireless has over 177,900 employees worldwide at the moment and it is considered one of the best employers in the telecommunications industry. According to the official application requirements enforced by the company, all candidates for Verizon employment must be at least 18 years old to be deemed eligible. Please note that all younger applicants will be automatically excluded from the hiring process. Job seekers interested in Verizon careers can explore the company’s official employment portal to find all the job listings. They can conduct a personalized career search by selecting their preferred career area and location. The portal will provide them with the complete list of available positions that meet their selected criteria. When they find a position that they want to apply to, they will have to create a profile on the Verizon careers portal by providing their e-mail address. Then they can proceed to fill out their online profile on the portal. Candidates must provide their main contact details for their online profiles on the Verizon application portal. It is recommended that they upload their resumes to their Verizon careers profile, but this step is optional. 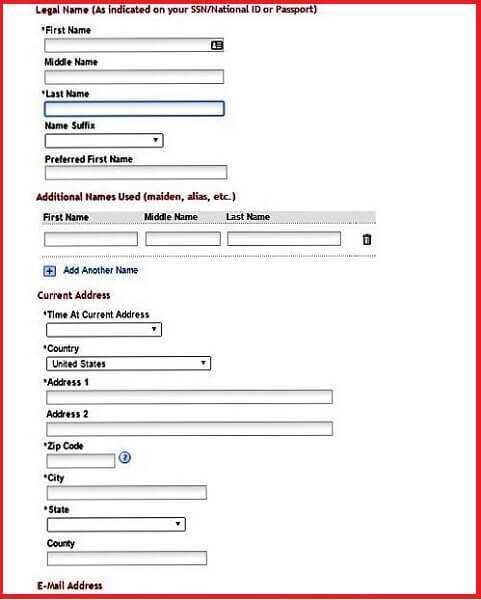 Candidates may also proceed to fill out their profiles and job applications manually. They will also have to provide their complete contact details for their profiles, including their complete previous addresses for the last seven years and their preferred contact phone number. Candidates are advised to include their resumes to their Verizon applications. After they complete their online profiles, they can proceed to fill out their Verizon job application forms. They will have to provide information about their professional and academic backgrounds to complete the forms. For this section of the Verizon Wireless job application form, job seekers may upload information about their previous jobs. Please note that candidates must only provide general information about their previous employment for this section. The aim is that they provide an overview of their professional experience. The extended information should be included in their resumes. 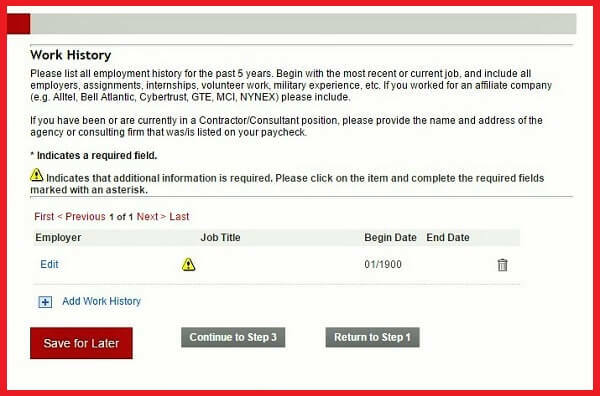 For the Work History section, candidates must include information about their previous employment to their Verizon application forms. For this section of the Verizon job application form, candidates are required to provide information about their academic background. As for the previous section, the main aim is that they create an overview of their education. The Verizon hiring specialists will find comprehensive information about their education in their resumes. 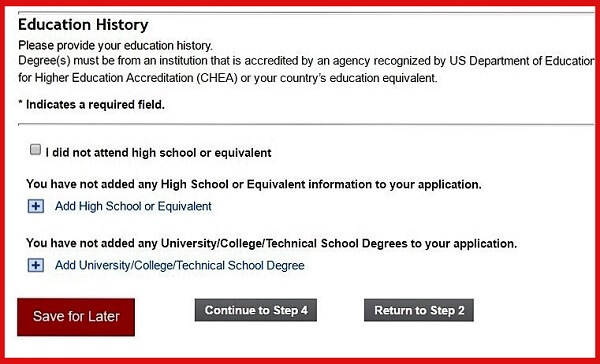 For the Education section, candidates are required to include information about their academic background to the Verizon application form. This section of the Verizon online application form requires candidates to provide details about their linguistic competencies. They are instructed to include a separate entry for each foreign language they speak and mention their specific proficiency level for each of these. For this section of the Verizon Wireless application form, candidates may include information about the licenses and certifications they may have earned throughout their careers. For each of these, they will have to make a separate entry on the portal and include the required details about the issuing institution of their license/certification, the issue date, and the expiry date. Please note that candidates may include as many entries as they deem necessary. For this section of the Verizon application form, candidates may include information about how they have learned about the position they are applying for. This information will help the company’s hiring specialists get a better idea of how visible the company’s listings are to job seekers. 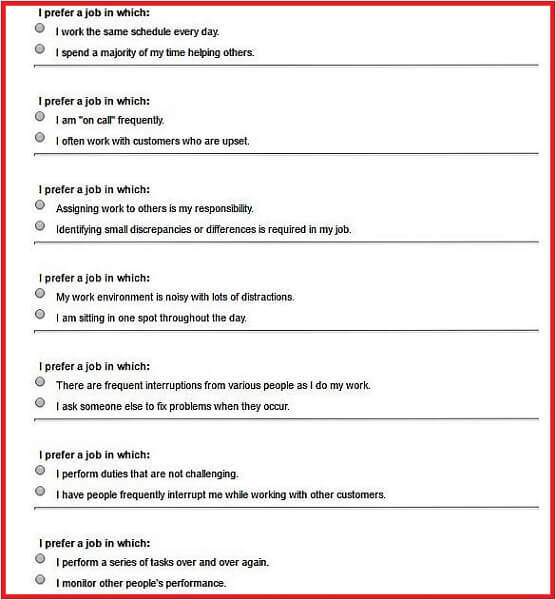 For this section of the Verizon Wireless job application form, candidates are required to answer an extended questionnaire about their ability to meet the main employment eligibility criteria enforced by the company, as well as their job preferences and expectations. For the first part of the questionnaire, they will be asked about their age, their legal authorization to work in the United States, and their requirements for work visa sponsorship. They will also be asked about their previous employment and any confidentiality agreements they may be required to adhere to. For the first part of the Online Questionnaire in the Verizon application form, candidates must answer the company’s employment eligibility questions. The questionnaire also requires candidates to mention whether or not they would be willing to submit themselves to drug screenings and background checks as part of their hiring process. Please note that these questions are mandatory. For the second part of the questionnaire, candidates are required to include information about their work environment preferences. The aim of this section is to determine whether or not the candidates are compatible with the position they have chosen. For the second part of the Online Questionnaire in the Verizon application form, candidates must answer questions regarding their job preferences. 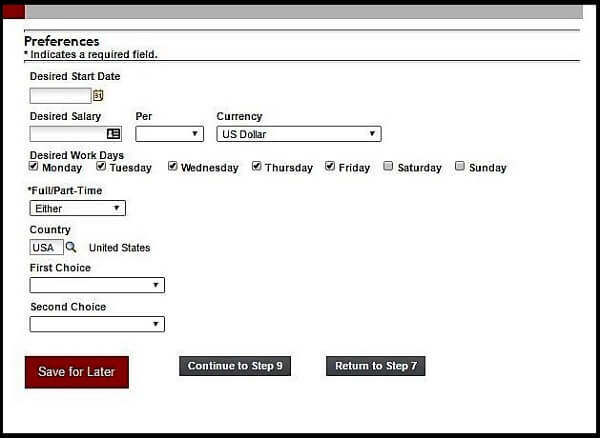 For this section of the Verizon job application form, candidates are required to include information about their desired salary, their daily availability for employment, and their location preferences. They will also have to mention the date they would be available to start work at Verizon. 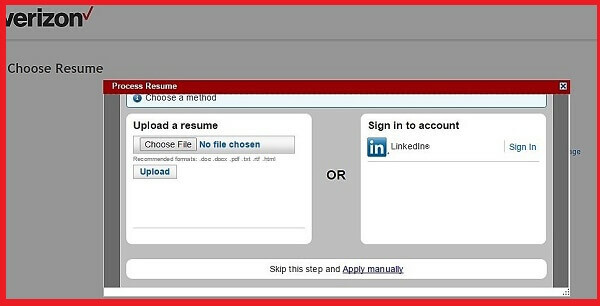 For the Preferences section, candidates must include their main employment requirements to the Verizon application form. After they complete this section, candidates may submit their Verizon Wireless applications to the hiring specialists for assessment. Please note that they will then be able to keep track of their application status on the portal. Job seekers can access the updated list of open positions at Verizon on the company’s employment portal. They can select their preferred career area and location to find the best-suited careers for their experience and preferences. To be considered for their chosen positions, candidates are required to send in their online job applications. A Verizon Wireless customer service representative is meant to assist the company’s customers and help them find the optimal solution to their issues with the company’s services. Their aim is to provide each caller with an excellent customer service experience. Verizon salaries for customer care representatives range between $26,000/year and as much as $63,000/year because the final rates are determined according to the specific performance of the employee. The company values the effort put in by its employees and so, it repays outstanding efforts with performance-based bonus packs. Job seekers interested in management careers are well advised to apply to Verizon wireless, as it is one of the leading companies in the telecommunication industry. They offer competitive salaries to their managers, as well as impressive employment opportunities. The complete list of available positions is available on the official Verizon careers portal. Healthcare Verizon Employee Benefits– Medical Plans, Dental Plans, Vision Plans, Healthy Pregnancy Programs, Verizon Employee Assistance Program, On-site Fitness Centers, Healthcare and Dependent Care Spending Accounts. Paid Time Off Verizon Employee Benefits – Generous Vacation Policies, Holidays, Personal Days, Opportunities for Schedule Optimization. Special Verizon Employee Benefits – Adoption Expense Assistance, Tuition Assistance, Online Development Tools, Job Training for Verizon Employees. Also according to the Verizon careers portal, the contents of the benefits packs may vary according to career level, location, as well as business unit. The Verizon job application form mainly relies on the resumes provided by the candidates because this is where they can include extensive information about their professional and academic backgrounds. This is why the official recommendation on the portal is that job seekers provide their resumes for the form. Candidates may also opt to fill out their Verizon applications manually, but the information they will be able to include about their professional experience will be limited to an outline of their careers. We strongly suggest that they keep track of this recommendation and upload their CVs to the online form. As the resume is the main document in the Verizon online form, we also recommend that they proofread it before they upload it to the portal. They should make sure that all the information in it is up to date and that it is properly presented to recommend them for their chosen Verizon careers. We also suggest that they include the additional documents of their resumes to the Verizon job application form. The most important one of these documents is the cover letter. This will give them the opportunity to express their interest in the company and the specific position they have chosen. A cover letter will enable candidates to provide a more personal approach on their Verizon applications, which is why we strongly recommend that they take the time to write one. The cover letter should be no longer than one page and it should be focused on the candidates’ personal abilities, rather than on their professional ones, as these are included in their resumes. 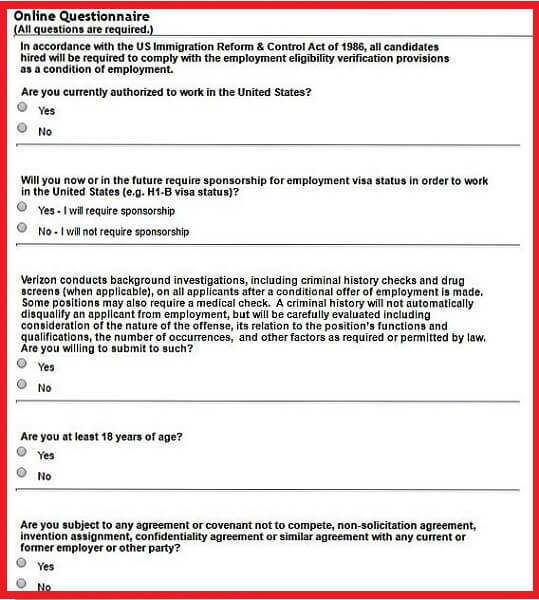 Another important section in the Verizon job application form is the Questionnaire section because it includes questions about the candidates’ ability to comply with the main requirements of the company and their chosen positions. Candidates should be honest in their answers, as any data inaccuracy may result in their dismissal from the hiring process. The vast majority of sections in the Verizon job application are optional, which means that candidates may submit their forms to the Human Resources department without filling out all the fields in the form. However, we strongly recommend that they take the time to complete as much of the form as possible because it is in their best interest to provide as much information to the Verizon hiring specialists as possible. Even if candidates upload their resumes to the Verizon Wireless application form, they should take the time to fill out the Work History and Education sections. The hiring specialists will analyze their applications before they get a chance to review their resumes. Therefore, it is important that their applications feature as much information as possible. The Verizon hiring specialists will analyze all the job applications sent in by the job seekers and they will select the best candidates for employment based on their professional skills and their compatibility with the company. Candidates should expect to be contacted by the Verizon hiring specialists by phone or via e-mail regarding the following steps of the employment assessment. The next step is usually the interview process, which may feature up to four job meetings, depending on the career level and department chosen by the candidates. When applying to a company as large as Verizon, it is very important that interview candidates are properly informed about the development of the company, the main products and services they offer to clients, as well as their main competitors on the market. We strongly recommend that they use Verizon’s official website as their main reference and that they complete their research online with information about the company’s competitors. Another important aspect that candidates are advised to include in their preparation process is their appearance. It is very important that they choose proper outfits for their job meetings and that these are properly correlated with the career levels they have chosen. Candidates aiming for high-level positions should opt for business formal attire, as this is the proper etiquette for the occasion. Those interviewing for entry-level positions, however, are advised to wear business casual outfits to avoid being overdressed. 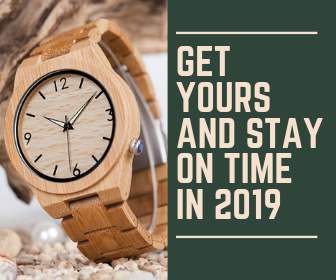 We also recommend that candidates find the ideal route to their assigned interview venues because it is very important that they arrive at least 10 minutes prior to the indicated star time of the meeting. They should avoid being late because this will give the Verizon hiring specialists a negative impression about them. Another useful means of getting properly prepared for their Verizon interviews is that candidates practice their interview answers before their meetings. To help them with this, we have selected a few sample questions that could give them an idea of the tone of the interview and the information they will be asked to provide. Please note that we have selected general questions for this article. Aside from these, candidates should expect to be asked employment-specific questions as well. Why did you apply to Verizon? What do you know about Verizon? What do you think makes you a suitable candidate for this Verizon career? What made you choose your major? Could you please tell us about the previous positions that recommend you for your selected Verizon career? How would you handle a dissatisfied customer? What are your expectations about this Verizon job? What are your greatest strengths? What about your greatest weaknesses? What can you tell us about yourself that is not included in your Verizon application form?